TAHOE CITY, Calif. — Dr. Hari Haran is slated to perform sacred Indian music during the Center for Spiritual Living, Tahoe Truckee Sunday service, June 16, 10-11 a.m. All are welcome. After the service, 12:15-4:15 p.m., Dr. Haran will offer a Music Therapy Workshop and a Kirtan Concert for $25. Also, on Sunday, from 5 to 8 p.m., Dr. Haran will offer three, one-hour, Vedic astrology readings for $85 each. On Monday, June 17, between 9 a.m. and 3 p.m., he will offer six more readings. As there are limited time slots, pre-registration is required. Dr. Haran began his training at the age of 7, and he travels worldwide presenting his spiritual expertise. He is chairman of the Indian music therapy research and development foundation and chairman of the Society for Music Education, Therapy and Research, in Pondicherry, India. Dr. Haran presents a listening therapy program using special filtered classical music to improve ear and brain function. A link is established between the sounds we hear and our functioning in speech, learning, energy and stress. 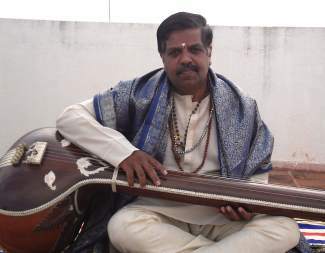 Dr. Hari Haran says his music is purely classical on traditional instruments which will not disturb the balance and equilibrium of your mind, and is very effective for healing ailments like blood pressure, nervous disorder, body pain, migraine, rheumatics, stress, anger, depression, heart ailments, sleepless-ness, and autism. It also is for positive approaches to marital harmony, personality development, medical professionals, cancer counseling, weight loss, diabetes, stress management, children, teenagers and more. This participatory workshop allows all participants to be an integral part of Dr. Haran’s unfolding teachings. The workshop includes aspects of sounds, including Kirtan and chanting sessions, meditation, satsung and bhajan. Dr. Haran gives a brief healing sounds concert using the tambura. Dr. Haran’s Vedic astrology readings require time, date and place of birth. Discussed are health, family, career, relationships, finance, etc., including ways to correct situations that are out of balance. Participants can record theirs sessions, if they wish, and each is given a pdf of their chart. Founded in 1986, the Center for Spiritual Living Tahoe Truckee is presently upstairs in the Tahoe City Marina building at 700 North Lake Blvd. It is a spiritual community dedicated to empowering individuals to discover an inner power that has the ability to transform their lives and make the world a better place. The focus of this loving community is in celebrating life and the unique preciousness of all beings. Call 530-581-5117 for information.